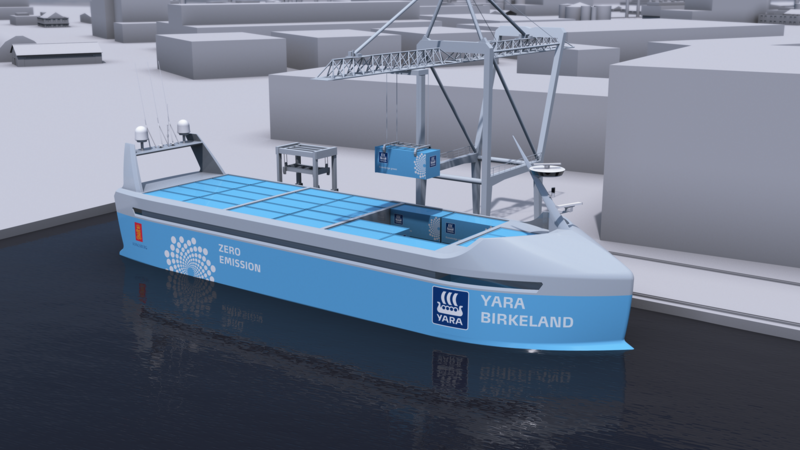 Norwegian companies Yara and Kongsberg have entered into a partnership to build a fully electric, autonomous ship. The ship, named the Yara Birkeland, will begin operations in 2018 with a small crew still on-board. It will be tested for automated journeys in 2019, to be capable of undertaking an unmanned voyage by 2020. Kongsberg is responsible for the sensors and automated systems, as well as the electric drive, battery and propulsion systems. The vessel will sail within 12 nautical miles from the coast, between 3 ports in southern Norway: an area covered by the Norwegian Coastal Administrations' vehicle tracking system (VTS). Automation affects both the lives of the crew and the design of the ships. The sailors for Yara will monitor it from desk-based shifts on land - a Kongsberg project manager explained to CNN. This means the ship doesn't need cabins or food catering facilities onboard, enabling it to be lighter. The potential for electric ships to minimise pollution is significant. An electric ship can only be called 'zero emissions' if its energy is sourced from renewables in a sustainable manner. The route planned for the Yara will replace up to 40,000 truck journeys, Kongsberg claims, reducing NOx and CO2 emissions and improving road safety. For sailors, a desk-based job means more time at home and with the family. Will this lifestyle prove more attractive to the next generation? Mixed feelings, improvement on shipping as is to be sure...where does this point us as a preadapdation? Aids DG-ML? Who does this most serve? #eShip - mmm - where are the charging points? Containers full of batteries ? !